Add an additional space to the trade row above Black Market. 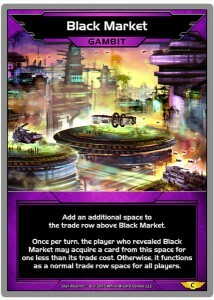 Once per turn, the player who revealed Black Market may acquire a card from this space for one less than its trade cost. Otherwise, it functions as a normal trade row space for all players.